If a man/nation does not humble himself/itself, he/it will commit crimes associated with prideful arrogance on a continuum. Sounds like the white man’s burdensome alliance of Britain, Israel and America. This ‘Law of Opposites’ is found in one form or other throughout the entire spectrum of scientific study as the principle of polarity or opposing forces; whether in subatomic spheres, the earth’s magnetic poles, in chemistry and electricity, in dynamic physiologic processes, or in the derivatives of mathematics. Occult Sabeans of the ‘Authentic Traditions of Magic’ posit this principle as ‘Dualism’ and attribute it to characteristics of God as Good and Evil. Specifically, this describes a psychotically projected fantasy of an hermaphroditic primal cause or Supreme Deity, as illustrated by the Gnostic Baphomet. Nevertheless, attributing valid observations of polarity in the created world as being inherent within Allah is a grievous pathological construct of anthropomorphic theology. Indeed, it is an egregious error to presume we can analyze and explain the nature of The Almighty in narcissistic terms. Love, for the psychopath, is an ephemeral phenomenon aimed at sexual adventure. Many psychopathic Don Juans are able to play the lover’s role well enough for their partners to accept it in good faith. After the wedding, feelings which really never existed are replaced by egoism, egotism, and hedonism. Religion, which teaches love for one’s neighbor, also strikes them as a similar fairytale, good only for children and those different “others”. Hence, proud sociopaths unavoidably subject themselves to mis-guidance, as do those who submit to them and mold their life ways accordingly by not rocking the boat of pathocracy. This all too common, conformed human condition is the unavoidable consequence of the implicit inverse determinants of all Spiritual Law, most especially the Law of Humility. To the contrary, when we humble ourselves before God we do not become a negative pole but rather consciously rid ourself of pride, even if momentarily. This creates a kind of metaphysical vacuum through which communications from an uninhibited fitrah  (common sense) or a Spirit of God (angel) may enter our sphere of cognizance and lead us to the liberty of truth in order to morally correct thought, deed and attitude in any given circumstance. This is not accomplished at the foot of a guru via mantras or the communal practice of Sufi tarikat. Quite the opposite, it is achieved through the ordinary processes of regular prayer followed by the communion of contemplation as described previously. After all, God grants his wisdom and grace to whomever He chooses. Hence, no one group has exclusive claim to either His guidance or grace. So be careful if you deem otherwise, for then you may be subject to the divisive sin of sectarian pride. Remembering also that when man puffs himself up with the Sabean ideations born of Nimrud’s Babylon, the ideations that enter his/her heart are leavened with the jinn-inspired yeast of falsehood. These whisperers, as the Qur’an instructs us, have indeed stolen some truth from the ether’s angelic conversations, but they are mixed with lies which magi, bomoh, priest, psychics and shaman amplify and present as absolute truth. Over time, these ideations are repackaged as semiotic guidance as slogans, catechisms, reforms, icons, idols, grandiose games (Olympiads), and sundry forms of rote travesties on the front-pages of the consensus building literature and media of mankind’s naturally manufactured hysteroidal cycle [PSYOPS]. The only way to escape this cycle is to remain humbly teachable yet psychologically strong enough to overcome evil ‘with the help of Allah’, which was, after all, Mohammad’s ensign.
. . . Man enlisted the natural power of animals in order to make his dreams come true, and when this did not meet his needs, he turned to his own kind for this purpose, in part depriving other humans of their humanity simply because he was more powerful. Dreams of a happy and peaceful life thus gave rise to force over others, a force which depraves the mind of its user. That is why man’s dreams of happiness have not come true throughout history. This hedonistic view of “happiness” contains the seeds of misery and feeds the eternal cycle whereby good times give birth to bad times, which in turn cause the suffering and mental effort which produce experience, good sense, moderation, and a certain amount of psychological knowledge, all virtues which serve to rebuild more felicitous conditions of existence. – Political Ponerology, op.cit. p. 85. All Secret Societies and circles of power are associated with icon bearing religions that endorse the grievous sin of pride, no matter the outer guise of self-made attributions or claims, or even remarkable achievements. When they finally reach the end of their self-taught walk on the earth, they will find that Satan holds the rope on which they crossed the chasm. Such is the Law of Humility and the horrid end of its inverse determinant. “Sabeans refers to the people of Harran who had a religion in which stars [Fallen Angels’ or ‘Watchers’] played a major role. 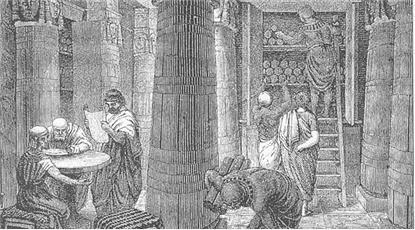 Moreover, they were a repository of Hermetic [now Freemasonic] and neo-Pythagorean philosophy. They played a major role in the transmission to Islam of the more esoteric schools of Hellenistic philosophy as well as astronomy, astrology, and mathematics. They became extinct during the first few centuries of Islamic history and must not be confused with the Sabaeans or Mandeans of Southern Iraq and Persia who still survive.” Shia, ibid, page 85, note 6. In a group in the process of ponerization, spellbinders [charismatic sophists politicians] take care of “ideological purity”. The leader’s position is relatively secure. Individuals manifesting doubt or criticism are subject to para-moral condemnation [marginalization]. Maintaining the utmost dignity and style, leadership discusses opinions and intentions which are psychologically and morally pathological. McCord, W. & McCord, J., Psychopathy and Delinquency. New York: Grune & Stratton, 1956. Subordinating a normal person to psychologically abnormal individuals has severe and deforming effects on his or her personality: it engenders trauma and neurosis. This is accomplished in a manner which generally evades conscious controls. Such a situation deprives the person of his natural rights: to practice his own mental hygiene, develop a sufficiently autonomous personality, and utilize his common sense. In the light of natural law, it thus constitutes a kind of crime. – Political Ponerology, op. cit.p. 139. Hysteria is a diagnostic label applied to a state of mind, one of unmanageable fear or emotional excesses. Here it is being used to describe “fear of truth” or fear of thinking about unpleasant things so as to not “rock the boat” of current contentment. – Political Ponerology, op. cit. p. 86.